boosting apprenticeship training contracts in upper secondary education: companies may conclude pre-apprenticeship contracts with the best performing students in the last grade of lower secondary education; the measure is seen as a commitment between the entity offering practical training and the student wishing to move on to upper secondary VET. The apprenticeship training offer has also been extended. 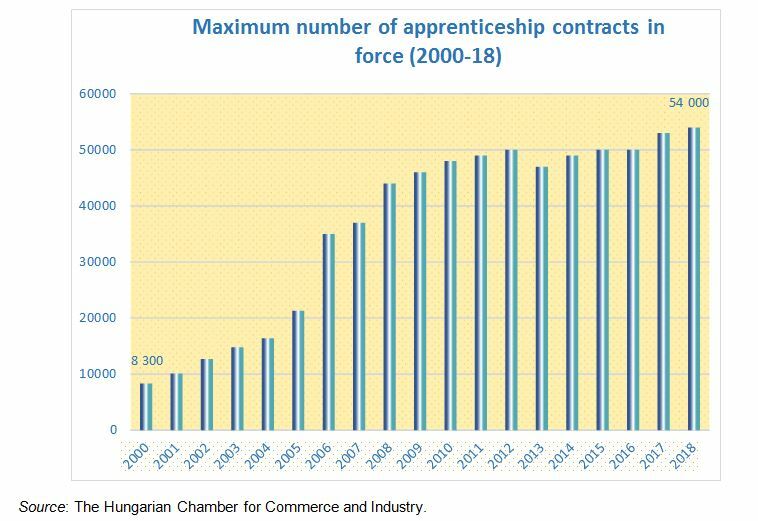 From the academic year 2018/19, students in the last two years (grades 11 and 12) of the four-year upper secondary programmes combining general and vocational education (szakgimnázium) may also conclude apprenticeship contracts. Previously these were mainly offered to students enrolled in practice-oriented three-year programmes (szakközépiskola). According to legislation there is no statutory upper age limit to pursuing vocational education and training programmes either in formal or non-formal education; this means that apprenticeship contracts are accessible to young adults wishing to combine work with formal studies  as well as in any other non-formal adult training programmes. In Hungary, 95% of small and medium-sized enterprises employ fewer than 10 employees. A new measure is in place to ensure the quality of practical training offered: since 2018, micro and small enterprises that fulfil specific requirements (business turnover, number of employees and form of business, as attested by a certificate issued by the chamber) may conclude more than 12 apprenticeship contracts simultaneously, if other entities cannot provide practical training places. Sectoral training centres currently being established will also be offering apprenticeship contracts. Inclusive education has considerable State support. Apprenticeship contracts for SEN learners (multiple disadvantaged students or learners with special educational needs) are not included among the contracts in force, but SEN learners can train for the second and any further vocational qualification in full-time education free of charge and without age limit. A financing scheme is in place for companies wishing to offer practical training. The State retroactively supports costs incurred in apprenticeship training; where the subsidy received exceeds the vocational training contribution due from the company, it can be used to settle other tax liabilities.